For those of you who have been following this blog, you will know that over the last eight months I have followed the development of the 1112 South Flagler condo development very closely. Tonight the City Commission will decide whether to approve the waivers requested by the developers. It is my opinion that the decision before the commission should be what their vision for this parcel of land is. 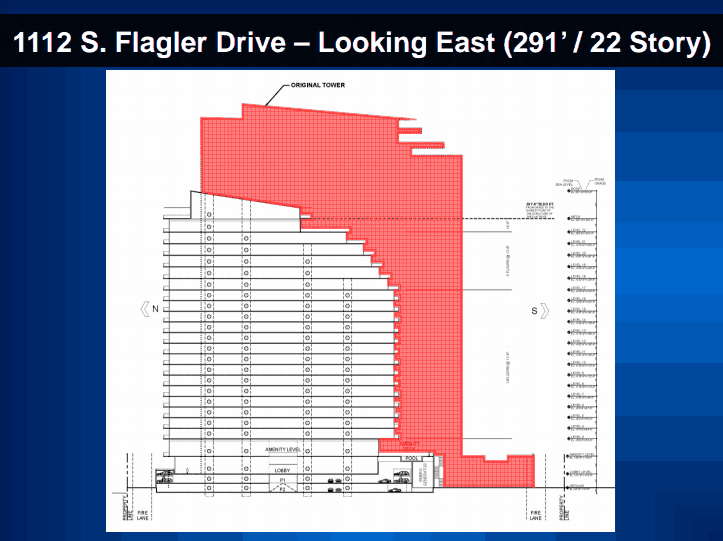 If the commission decides that the best use of this piece of land is for a multi-family development, then they should grant the waivers requested by the GAK Group for the development of 1112 South Flagler Dr. I am not an expert in West Palm Beach zoning, but I have followed the progress, sat through every meeting, visited the site, spoken with many of the parties. Having said that, any opinions that proceed are mine alone. The initial proposal of a 97-unit 420ft version of the building was proposed to the planning board in July 2013. Before the presentation was made I shared my personal thoughts in a blog entry titled “The Chapel by the Lake Development is Too Big“. The zoning code outside of downtown is complex. Because this was owned by the Church it was zoned for Community Service. This means that the largest development you could put on it was a five-story medical office building. The developers wanted to go bigger and wanted to change the zoning for multi-family use. The City Commission was required to approve the zoning change and the waivers before the development could be approved. In the months that followed multiple versions of the building were presented to the commission. In each of the three six-hour meetings that followed I stood up and spoke against the project for the same reasons that I wrote my initial blog entry. In my opinion the project was still too big. Get feedback from the community and implement those changes in the next design that is brought to the commission. In December GAK Group held a “Community Outreach” meeting where they asked the community what they could do to make this development more acceptable to the community. Before going to this meeting I took some time to come to think about my stance and what it would take for me to change my mind. My main issues were mass, and that the development would be taking valuable “water views” away from people walking / biking down Flager. I want developments that I can be proud of, and that I can bring friends and family to view as part of what makes West Palm Beach special. The tone of this meeting was more constructive (no pun intended) than previous meetings. The developers didn’t say a word, simply listening to what the attendees were suggesting. I suggested that as well as scaling down the project, a public bike / walking path around the development, as well as a public restaurant, would “give back” the waterfront to the public. After several weeks, I got a call from Al Adelson and Eugene Golob (the developers) who wanted to show me the new renderings that they had come up with based on the feedback they received. This set of renderings showed a greatly reduced building with a public path around the outside. The difference between the first proposal and what was now being proposed was significant. Check out this blog entry for more renderings. The Red indicates the initial design, the white shows the existing version. When meeting with Mr. Adelson and Mr. Golob, one of my concerns was that this ultra-luxury condominium project will be branded and marketed as an extension of Palm Beach instead of a Signature West Palm Beach Building whose marketing promoted the West Palm Beach lifestyle and all the great high-end amenities that our city offers. At this point the discussion moved from 1112 South Flagler Dr to Clematis Street, Cityplace, the Kravis Center, Palm Beach Dramaworks, Antique Row, Northwood Village and our great dining experiences available within walking distance of the 1112 South Flagler Dr condo. Contrary to popular opinion, it turns out that even the ultra wealthy enjoy walking and riding bikes and living in close proximity to a dynamic urban environment. This speaks to the dynamic nature of West Palm Beach. 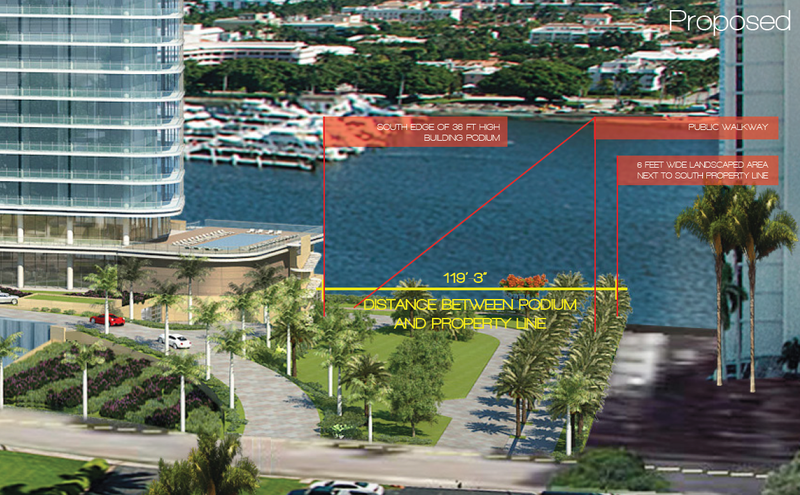 Mr Adelson assured me that it was the developer’s full intention to be a contributing part of the Downtown West Palm Beach environment, and not only help inform the new West Palm Beach residents about the local amenities at their disposal but also to promote West Palm Beach in the marketing of these condos to the ultra-wealthy. Okay, back to zoning. In my meeting with the developers, I was able to ask some very specific questions about the zoning issues and what could be built there. Currently, without any waivers of any kind a developer is able to build the following office / residential complex on the land. What can be built on this site “by right” without any waivers. Because it’s not the commission’s vision to build an office building on this very valuable and beautiful piece of land, in the very first meeting the City Commission showed interest in rezoning this as MF32 which would increase the density of the land and allow for multi-family developments. Under MF32 the following building could be built “by right”. 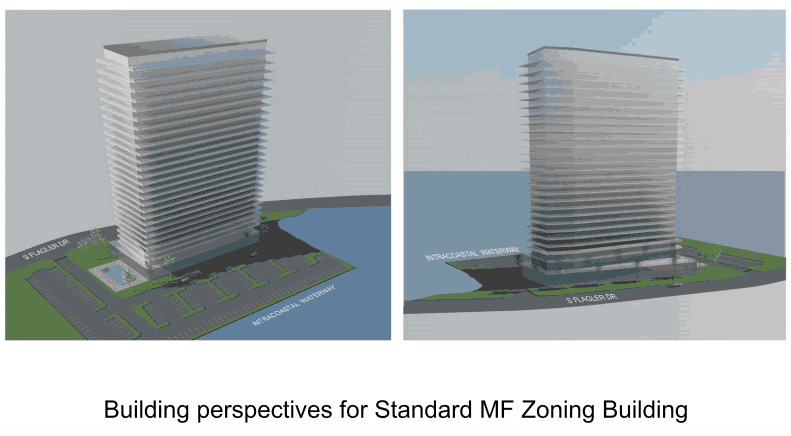 The building that can be built “by right” with the MF32 zoning is larger than the building that is currently proposed. 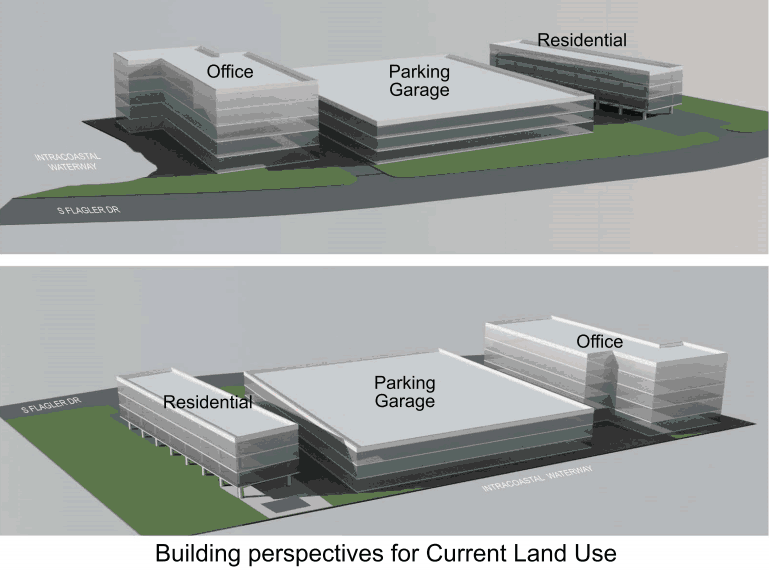 The difference is the surface parking. To build a high-end condo and provide covered parking requires building a pedestal which would be much larger than the building itself. View of the podium under the building. Next time you’re there stop and look at the land from a couple hundred feet away. If a five-story medical office with covered parking is built there 100% of the views will be gone. If a condo was built that conformed to the MF32 zoning, we would turn the space into a parking lot, like the terrible Trianon next door. It would be my preference for this plot to remain as a place of worship or be turned into a beautiful park. But unless the people of West Palm Beach pony up $20 million to purchase the property, this is not an option. One of the overlooked parts of the “greater downtown” area is Palm Beach Atlantic (PBA) and by extension the First Baptist Church (FBC). Despite being outside of the technical Downtown area PBA is an integral part of downtown. 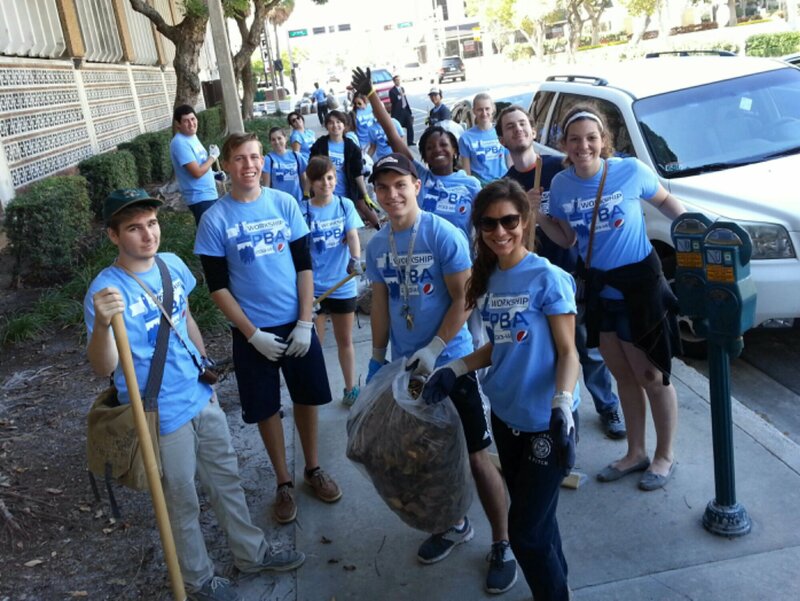 Yesterday I was walking through downtown and came across a group of PBA students to had taken their Martin Luther King Day to help pick up leaves in the Downtown area. This was a program organized with the FBC. One of the unique things about this sale is that part of the proceeds will go to the complete overhaul of the FBC parking lot. Currently the FBC parking lot is made out of multiple independent lots which are not only terribly ugly, but also cause major traffic jams at peak times when the church or PBA is letting out. The developer stated that $22 million will be going into the redevelopment and landscaping of both sides of Flagler. I was interested in how this area currently looked. So on my way to the Green Market one Saturday I did a “Site Visit” and took some pictures of both the area at 1112 S. Flagler Dr. as well as the FBC lots. Photos of 1112 South Flagler Dr. I think you’ll agree with me that both of these properties need a lot of help. Not only will this development bring in the money to make the changes needed to the FBC land, but the taxes alone will also bring in an addition $1.1 million to the City and $1.1 million to the County and School District. One of the things that impressed me when I met with Eugene Golob was him saying that in all his significant years of developing, he had never seen a group of neighbors who were as united and vocal against what they didn’t like about this waterfront development. One of the big fears that I have heard was that the development of this condo would open the door to additional high-rise condos up and down our beautiful waterfront. When I hear from a developer that the community has been engaged enough for them to make substantial concessions, including a public walk/bike trail around the property, it is clear to me that the community is a player in the development of West Palm Beach. The owners of this land have already decided to sell it for development. If the community shows that they are willing to be constructive parts of the discussion, then we send a message to future developers that if they want to develop in West Palm Beach, it will be with the understanding that they will need to come to the residents first . A futile “stand” against an inevitable development takes you out of the conversation, and risks putting the community in a position where they get a big building with a developer who gives them no concessions. Having addressed the community, we have to address the City of West Palm Beach’s largely flawed and confusing zoning codes. The city staff and Commissioners should not be placed in a position where they are forced to make major decisions about the future of the city on a one-off basis every time a developer comes to them and asks for a waiver. The City of West Palm Beach made a revolutionary move in 1995 when they created the Downtown Master Plan. This plan alongside the non-political Downtown Action Committee which approves or denies developments has transformed the Downtown area and given way to planned and responsible growth. The City of West Palm Beach must address the Zoning Codes and create a form-based plan where condo developments have a place, but waivers are not granted on an adhoc basis. If you are still reading this, thank you. Personally I have nothing to gain or lose from the building (or not building) of this condo. Since I was very vocal about disliking the initial proposal, it’s only fair to let my readers know that my personal concerns have been addressed. While I didn’t get everything I wanted (I still think it would be a fantastic place for a waterfront restaurant/steakhouse), the concessions that were made from everyone at the table were significant and lay a good groundwork for moving forward as a city and downtown community. I loved the part saying if you are still reading this “Thank you”! You are the BEST writer and love how you consider everything and everyone. I agree so much with what you said here. “The city staff and Commissioners should not be placed in a position where they are forced to make major decisions about the future of the city on a one-off basis every time a developer comes to them and asks for a waiver.” This has to stop!